Nothing says ‘happy sunrise’ like a shapeshifter romance. Let’s face it, we all have our guilty pleasures, some of us more than others, and Shapeshifters are one of mine. It doesn’t matter the pairing or if there is no pairing at all, I’ve found that there are just so many dynamics to the genre, between pack infrastructure, to hunting practices, to how common place (or not) particular forms are, to the wide variety of creatures authors have chosen for their characters to shift into. While the wolf will always be the proud, majestic animal that first drew me to reading (and watching) shapeshifter themes, I have a huge love for Werebears (especially Polar bear shifters and the mythology that often accompanies them.) It’s been interesting to see how the genre has evolved over the years to include Avian shifter and snake shifters and even sharks and I continue to look forward to seeing what creature is presented next. 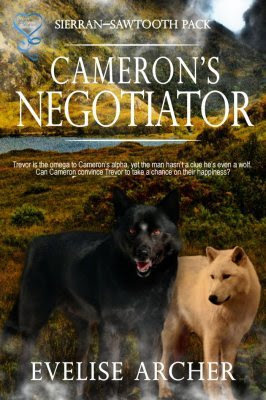 That having been said, it’s always fun to curl up with what brought me to the table in the first place, so when the opportunity arose to read and review Cameron’s Negotiator by Evelise Archer, through the Don’t Buy My Love program at Goodreads, I jumped at the chance. In it I was treated to a swiftly moving tale of Cameron, the Alpha wolf of his family's pack and Trevor, an FBI negotiator who, injured on the job and needing time away to recover, ends up in a Rocky Mountains cabin not far from the pack's territory. It doesn’t take long for Cameron to catch scent of him and deduce that Trevor has to be the mate he’s been waiting nearly a quarter of his life for. Spooked by the wolf, Trevor flees, but later decides to search for it, and who better to guide his quest? You guessed it, Cameron. Now here’s where the story started moving just a bit too quick for me. Within’ three hours of the start of their search, they begin expressing interest in one another AND get a little steamy. Cameron slips up and starts using the word mate, while Trevor still doesn’t know that shifters exist, and a very short time, as in hours, later, they’re sitting at Cameron’s family home with him explaining the whole thing. Things go pretty insta-love from that point on. Trevor shares his family history, the in-laws start prepping for a wedding, and Trevor shows little to no difficulty taking it all in. Not only that, but when his FBI partner and friend arrives at Trevor’s request and is soon filled in on everything, HE has little to no difficulty accepting everything he’s being told about mates and shifters as well. In a world where the characters talk about it being a secret that shifters exist, it just all seemed too readily adjusted to by outsiders. The dialogue was another issue for me. It simply didn’t come off as natural. Terms of endearment appeared out of nowhere, and the dirty talk during the steamy bits was a bit cheesy. I was left torn at the end of the book between wanting to know more about the new pairing implied at the end of the book to set up for the sequel and not wanting to know for fear that it would come across as rushed as this one took place.